Jessica Hannah, Showroom No. 6 (Robot Lady Talking on Phone), 2008. Performance view. One wouldn’t expect an exhibition titled “Ladylike” to present a view of feminism that narrowly focuses on female-identified women artists and thus excludes feminist-inclined men and transgender, transsexual, and intersex persons. Despite this limited scope, artworks that explore feminist identities via Second Life avatars, 1950s-era gender norms, and old-world folklore stand out. In her short video I Am a Fashionista (IRL, I Wear the Same Pants Everyday), 2006, Stacia Yeapanis explores virtual bodies, dressing her Sim avatar in fifty of fifteen hundred downloaded outfits, chronicling her online life and in the process updating for the twenty-first century the explorations of the media landscape by ’70s feminist artists. But in Yeapanis’s work, as is typical of our Internet-saturated world, there is an added layer of disconnect from the physical self. Jessica Hannah’s performance Showroom No. 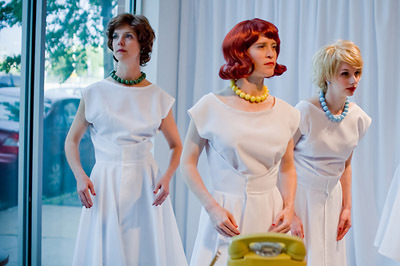 6 (Robot Lady Talking on Phone), 2008, presents a fictitious company whose aesthetic is straight out of the ’50s; it creates robotic female companions. On opening night, Hannah and five other women were dressed in matching white, sleeveless, knee-length dresses, perfectly coiffed wigs, and clunky vintage necklaces. As viewers curiously lifted the receivers of pastel-colored phones with the human dolls’ names on them, they were confronted with a real-life robot woman’s blank, slowly tilting face. While listening to one of six eerily intoxicating dialogues describing how the doll could be “your perfect companion,” the robot performers’ vacant gazes aroused discomfort mixed with intrigue and eroticism, suggesting the performative aspect of every sexual encounter. In three quaint embroideries from her 2006 series “Lessons from My Mother,” Transylvanian-born artist Andrea Dezsö continues discussions of gender and sexuality in the old country’s “folk wisdom.” Inserting small, finely stitched images of a nearly dead, yellow-colored woman, a green bowl of goop, and tiny silverware between the lines MY MOTHER CLAIMED THAT HEPATITIS IS A LIVER DISEASE YOU GET FROM EATING FOOD YOU FIND DISGUSTING, Dezsö comments on these pervasive notions about sexuality. This conceptually loose exhibition would have been more memorable with a little focus, but it does manage to engage myriad aspects of contemporary feminism.